Love them or loathe them, there is no denying that pine martens are very attractive animals. These cat-sized members of the weasel family have lovely chocolate brown coats with an orangey bib, a thick bushy tail, and a bright, inquisitive nature. 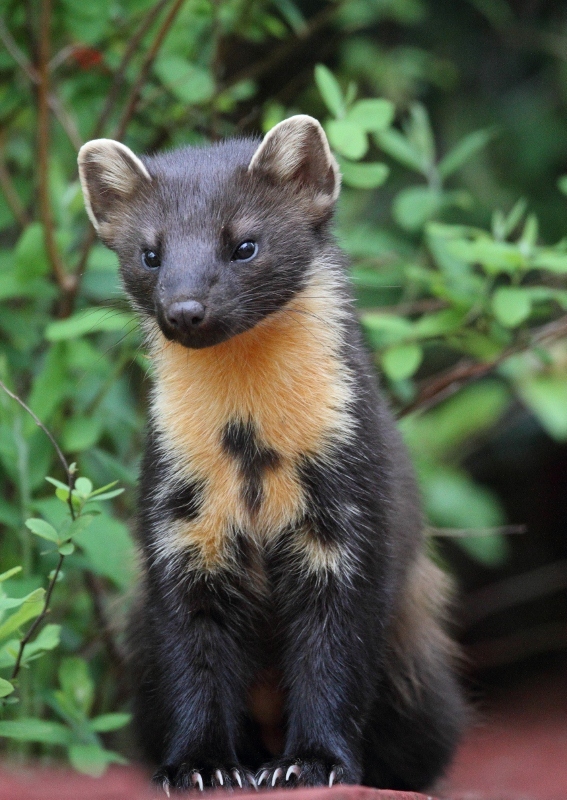 Also known as sweet marts, pine martens are relatively odourless, as opposed to the foul mart or polecat. 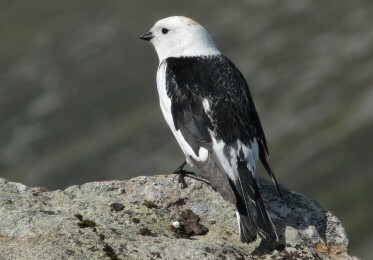 They are iconic members of the Highland fauna, scarce elsewhere, but relatively common in Lochaber. Population estimates typically range from 6-10,000, but it appears they are increasing both in numbers and range in Scotland, with reports from both Aberdeen and the Borders. 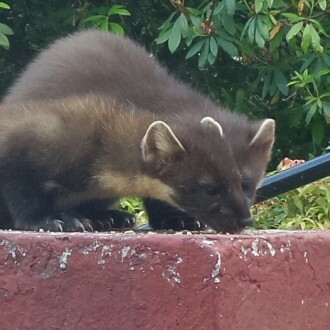 Given the right conditions martens can breed when they are only a year old, producing a litter of 1-6 kits in March, which they then look after up to and even through the following winter. Normally solitary, the mother rears kits by herself within a much smaller territory than the males, which might range over several kilometres. Dens are made in holes in trees or roots, boulders or in buildings. 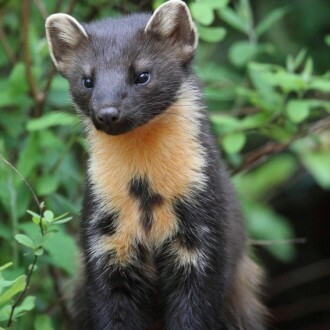 A nest of pine martens in your loft is not particularly desirable, except to a marten, but please note that this species is protected under the Wildlife and Countryside (Scotland) Act, and therefore advice should be sought from Scottish Natural Heritage before removing them. Martens are quite opportunistic in what they eat, with a staple diet of small mammals, supplemented in season by nestlings, eggs, berries, beetles and even carrion. Like other mustelids and foxes, a marten can be very destructive in a chicken coop, as prey is killed with a view to stashing it for later consumption. Noted for its sweet-tooth, the marten can also be attracted by a number of sweet treats, including peanut butter pieces and even cream cakes! 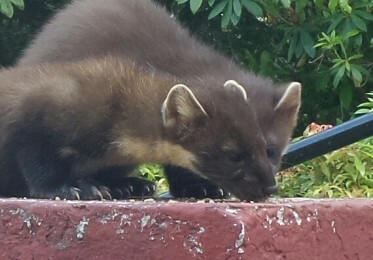 Pine martens have been resident around Glenloy Lodge for over forty years, and for most of this time they have been attracted with food, to the delight of visitors and residents alike. 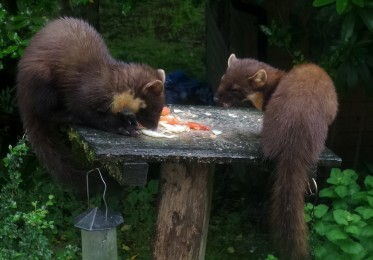 At present martens are fed daily, largely with leftover bread and jam or peanut butter from the breakfast table. Generations of martens have come to recognise this as a reliable food source, and while our resident female is a daily visitor, her extended family also visits. 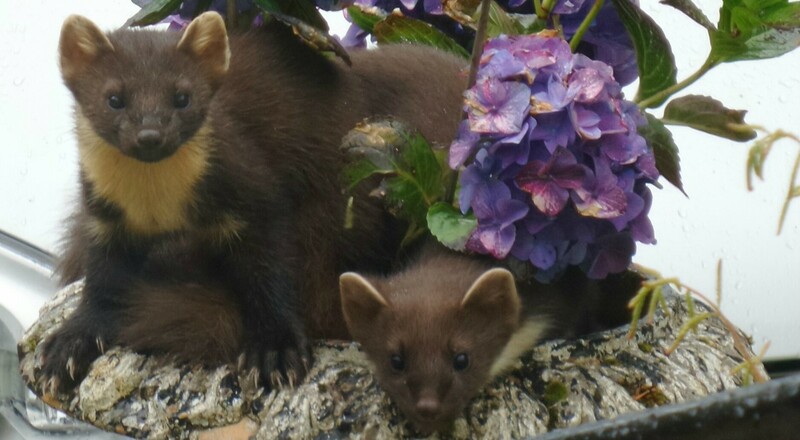 Kits are brought out of the natal den usually in the second half of June and the summer is often a good time to see a family of young martens, if breeding has been successful. At other times of the year generally one or two, but occasionally up to four martens at a time may be seen at the feeding station. These include the resident mother and a number of male relatives, generally her own kits. Other females are rarely tolerated. Pine martens can be individually recognised from dark markings on their bibs, but we have found that each has a recognisable character. 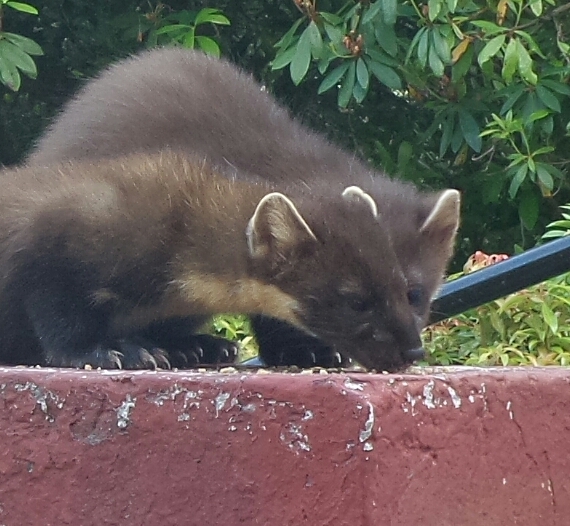 The martens feed on a low wall directly outside the sun lounge and also on the window ledges. Although more active at dusk and throughout the night, the Glenloy martens tend to look for food long before it gets dark, and females can be seen throughout the day, particularly when they are feeding kits. Not surprisingly, many naturalists visiting Scotland want to see martens, and this wish is best fulfilled where martens are being fed. 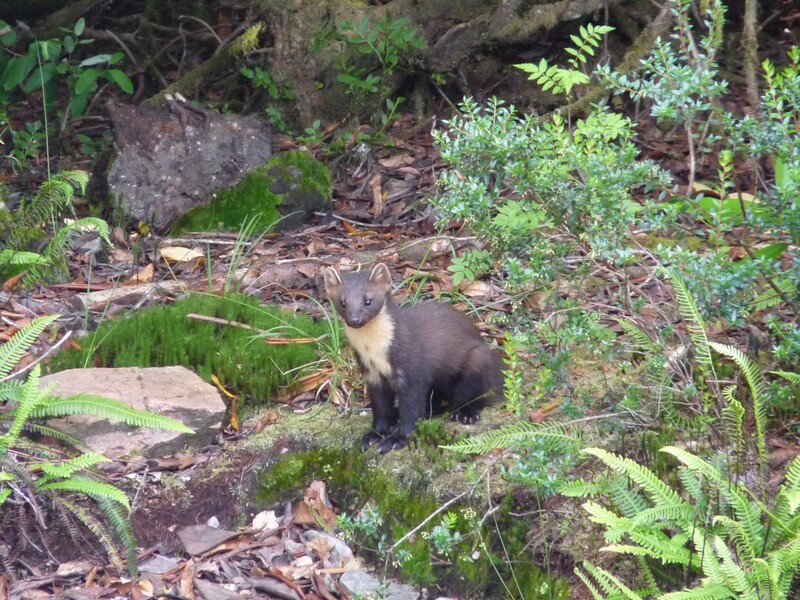 Glenloy Wildlife offer wildlife watching holidays in which the martens are almost guaranteed to be seen, including special marten breaks on a B&B basis. 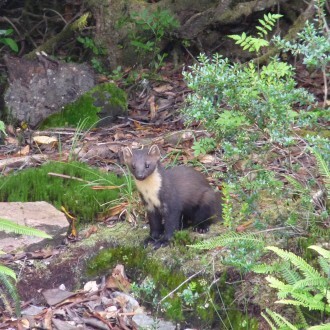 We are also offering exclusive pine marten viewing evenings for non-residents. Photographers should note that pine marten viewing is from behind the glass windows of the sun lounge. 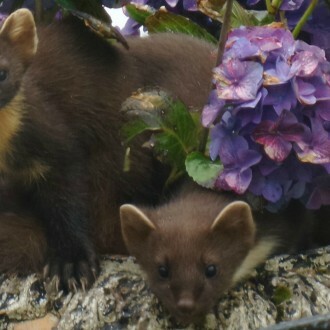 The pine martens approach very close to the house and long lenses are seldom needed. If you wish to photograph martens in more natural settings, then special arrangements will have to be made. Please contact us for further details.